Very gently-used. Used two seasons only to make shallow starter holes by non-electric-hand-drilling. We only used it by hand-turning just a bare bit (first season, dad's hands) or the drill bit in a pin vice (second season, scout's hands). Never used with an electric drill. Maybe 16 total shallow starter holes. See? Very gently used. Includes the #44 bit, original instructions, and original packaging. 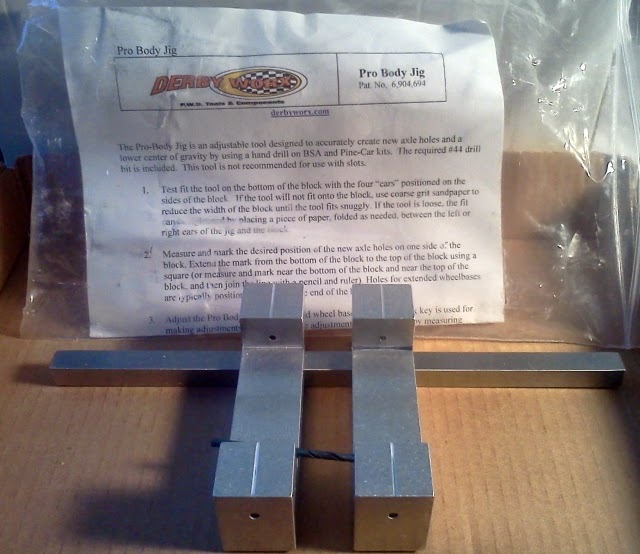 This jig, used in conjunction with advice from Derby Talk, helped produce two first-in-den trophies and one first-in-pack trophy. But, past performance it no guarantee of future returns. $30, includes shipping (but not insurance, so if you want it insured, we'll add that amount to the total). New ones cost $42.95 + shipping. Last edited by aphonos on Sat Feb 20, 2016 11:45 am, edited 3 times in total. If you don't mind me asking, what are you moving to? 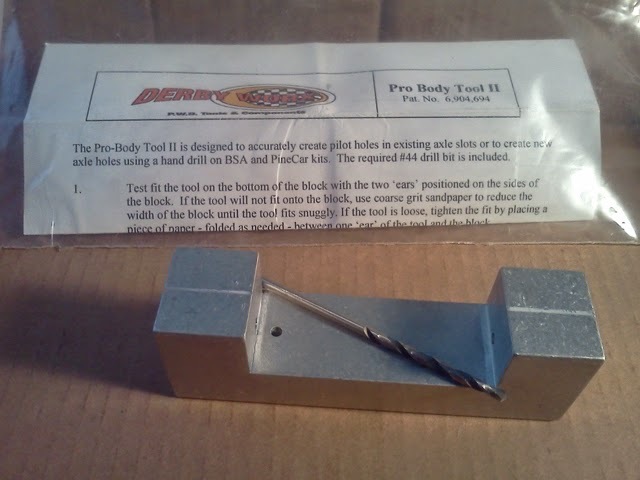 I ask because I got a Block/Silver Bullet this year and did well, but still needed the Pro Body Jig to mark the start of the holes before drilling my canted axle holes. Much like you, I thought I'd ditch it, but have now decided to keep it for that function alone. Edited original post and bumping to the top for 2015 season. I'm glad, TXDerbyDad, you've had success with using this jig for starter holes. Maybe another user will be able to benefit from that advice as well. I used the Pro Body Tool for the front holes and the Jig for the rear axle holes to drop it closer to the track. BUMPING for a new season - still for sale. Make an offer.